The Whittaker method is a system of betting on roulette that resembles the Labouchere Roulette system in that it requires you to examine previous bets when placing new bets, but the system is most like the Fibonacci system in that it requires you to use a set string of numbers. 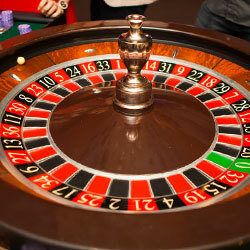 You may also see this roulette system sometimes referred to as the Whittaker system. When you’re playing with the Whittaker method of betting, you let two losses pass before you begin a progression. Then, you add up the sum of those two losses to determine how much you should bet next. For example, let’s pretend that you started with a bet of $1. This is the exact same sequence of numbers that is used in the Fibonacci roulette strategy because you started at $1. You can read more about the system here. You place your bet of $3 and lose. You write 3 on your paper. Your next bet would be for 3 + 0 or $3. You lose and write 3 on your paper, so your paper now says 3 3. Your next bet would be for 3 + 3 or $6. You lose and write 6 on your paper, so your paper now says 3 3 6. Your next bet would be for 3 + 6 or $9. You lose and write 9 on your paper, so your paper now says 3 3 6 9. Your next bet would be for 6 + 9 or $15. You lose and write 15 on your paper, so your paper now says 3 3 6 9 15. Your next bet would be for 9 + 15 or $24. You lose and write 24 on your paper, so your paper now says 3 3 6 9 15 24. Your next bet would be for 15 + 24 or $39. You win and cross off the last two numbers, so your paper now says 3 3 6 9 15. You bet $15. You now cross off the last two numbers, so your paper says 3 3 6. You bet $6. You win and cross off the last two numbers, so your paper says 3. You bet $3 and win. At the end of this example, you have made $3, decreasing the size of your bet by two steps every time that you win and increasing it by one every time that you lose. Even though you lose many more times than you won, you were still able to make a profit. To make the most of this system, it’s important to have a winning goal and a maximum spending goal in mind before you take to the table. If you wanna see more tricks and tips on how to win at the roulette, please take a look at this page. Try the Whittaker system out at an online casino and you’ll be able to master it quickly.